3 - 4................Chico von Forell. 4,4 - 4,4..........Bryan von Forell. 4 - 4,5,5..........Odin von Forell. 5,5 - 5,5..........Vello von Fürstenfeld. 14/12/1986: Club Champion in IPO 2 with 92-88-81 = 261 points. 04/10/1987: Club Champion in IPO 3 with 91-94-89 = 274 points. 24/09/1989: Regional Champion in IPO 3 with 80-98-90 = 268 points. FCI World Champion in 1990. IDC Sieger in 1988 and 1989. Dutch Dobermann Club Winner 1987 and 1995. 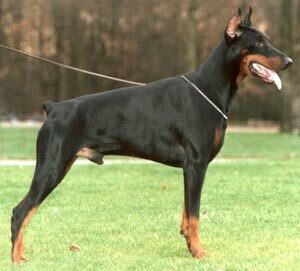 Belgian Dobermann Club Winner in 1987. French Dobermann Club Winner in 1988 and 1989. Baron Bryan vom Harro's Berg passed the ZTP with 1A rating for character and V for conformation plus a winner of numerous show championships. Bryan together with his handler, Mr Hennie Hartog, achieved IPO III in under 20 months of age and Schutzhund III shortly after with excellent ratings (best score of 290 points). He also passed the French and Belgium character tests with good ratings. Bryan inherited his sire's calm, sociable and uncomplicated character, although he lacked Cecar's hardness. Bryan possessed good, robust working drives with the balance being upset by a low level of active aggression and a high irritation level. Where Bryan introduced a truly positive influence into the gene pool was in his ability to produce stable and calm offspring. Bryan lived to 11 years of age (passed away from cancer) and tested clear for PHTVL/PHPV. His sire, Baron Cecar van Rensloo, was a Netherlands working and conformation Champion while his dam, Vitesse vom Franckenhorst, passed the ZTP with 1A rating for character and V for conformation. Odin: IPO 1 and passed the ZTP with 1A rating for character and SG for conformation. Odi: SchH 3 and passed the Körung 'for life' with Körklasse 2A rating and dam of the van het Wantij “G, R” litters. Ondra: dam of the Huz “O, R” litters (Octavia, Rio Grande).